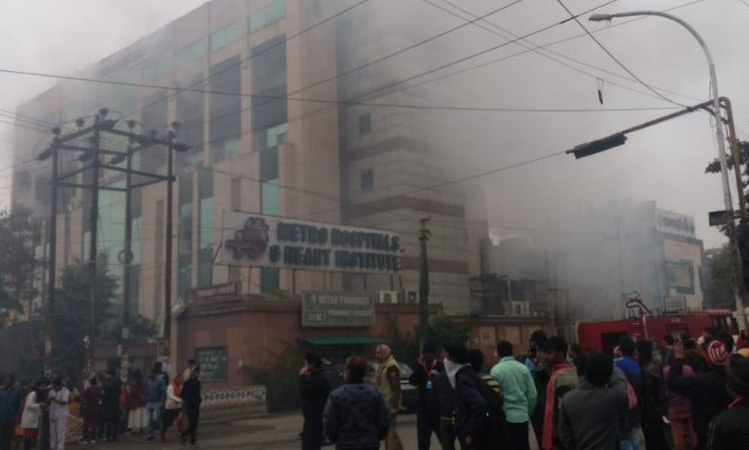 Noida: A fire broke out in Metro Hospitals and Heart Institute in Noida on Thursday, trapping several people inside the multi-storeyed building. There were no immediate reports of any casualties, officials said. About 30-35 patients were rescued and shifted to local hospitals, said Vaibhav Krishna, senior superintendent of police, Gautam Buddha Nagar. Four fire tenders were rushed to the spot and the situation is “now under control”, Krishna told PTI. Staffers tried to help patients out of the building in Noida, a suburban town in Uttar Pradesh on the outskirts of the national capital. Thick smoke could be seen billowing out of the building in Sector 12. People stood on ledges and on balconies as rescuers tried to reach them by smashing glass window panes.